Do you have two colors that you just love and want in your house? I know I do! For me, those colors are definitely navy and white. I just adore them. 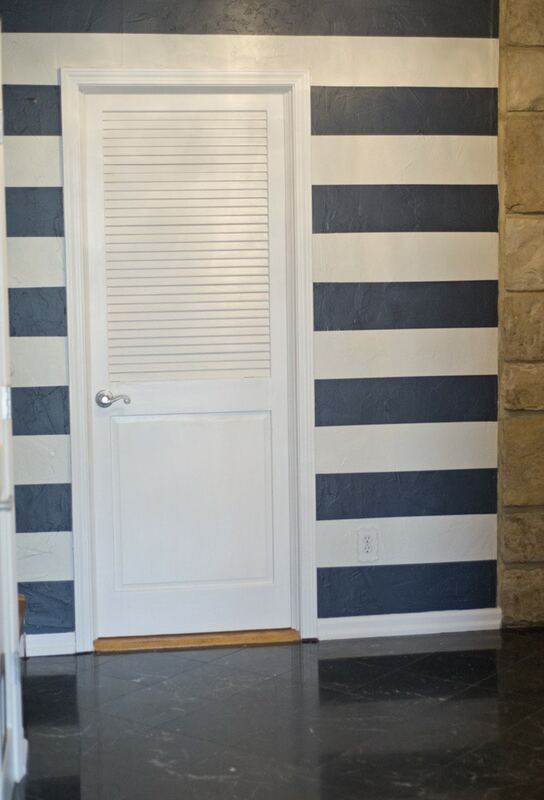 My clothes are mostly navy and white; why shouldn’t a wall in my house be a navy and white stripe? 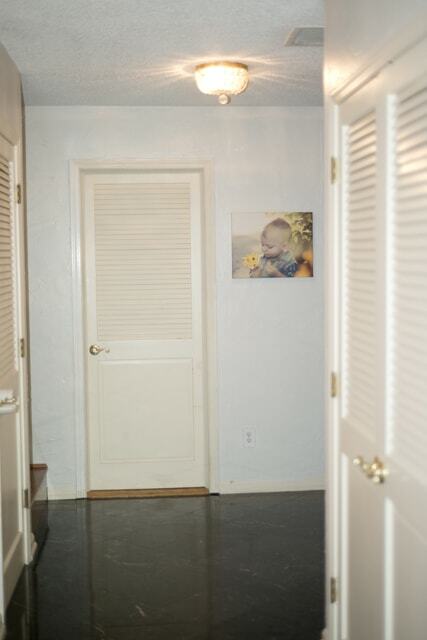 Seriously though, our entryway lacked personality and seemed to be the perfect spot to have a navy and white wall. The one issue was that our walls are textured. 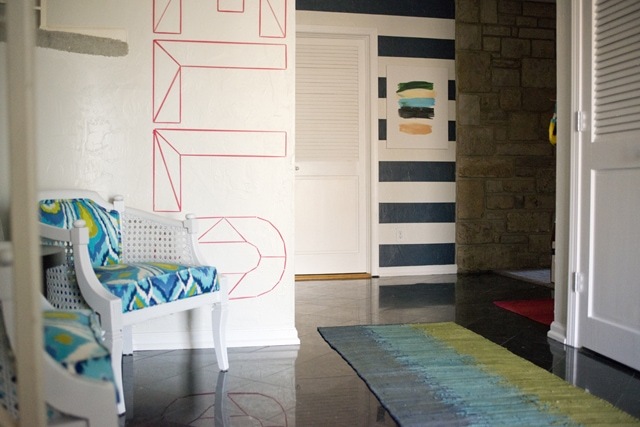 So, if you have textured walls but really want painted stripes… go for it! 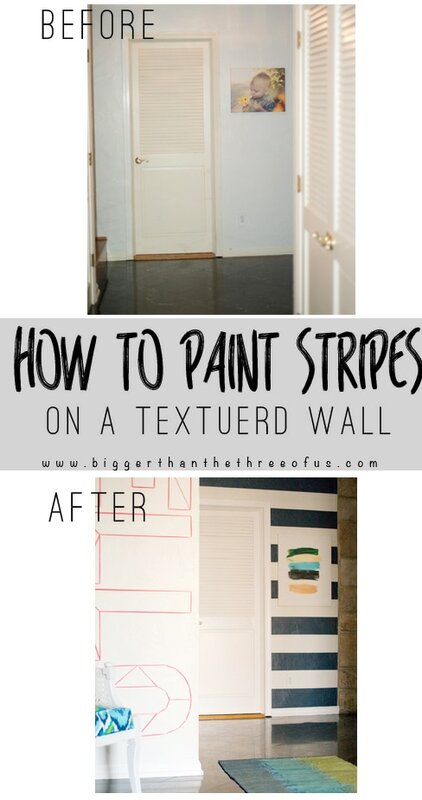 Here’s How to Paint Stripes on a Textured Wall! We needed a statement wall and knew that painted stripes, even on a textured wall, would provide the statement that we were looking for. So, we went for it and are so glad that we did! Make sure to check out our Bold and Bright Entryway Reveal for more pictures and details! Ok, let’s get onto the tutorial. First things first, gather your supplies. You will need good painters tape (we used Frogtape), paint brushes, and two colors of paint). 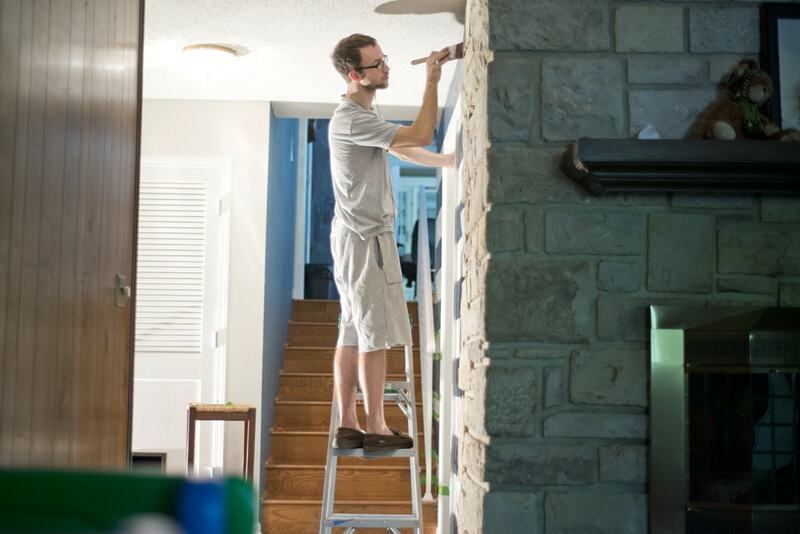 Paint your wall (roll the whole thing) with the lighter color. 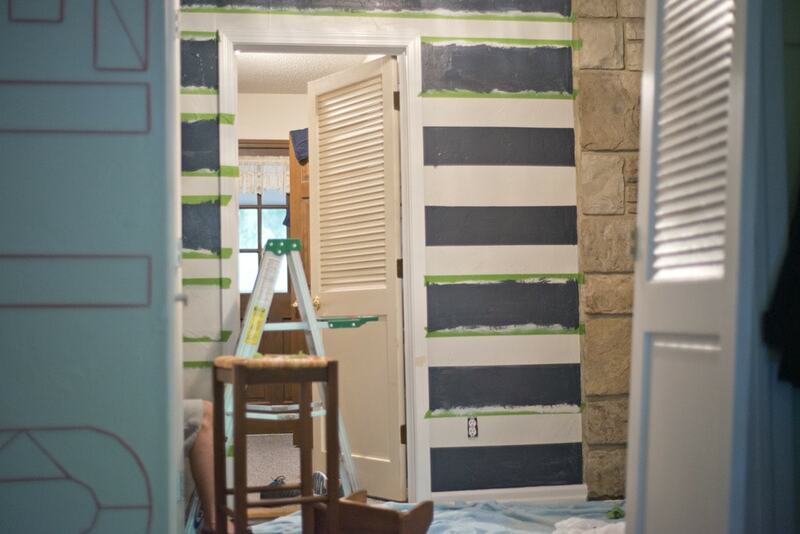 Let the paint dry and then use a level and ruler to tape off your lines for your stripes. We went for the same width of stripes for the white and the navy. We measured our wall and then figured the stripe dimensions based on the wall height. Tape off your stripes and then come back over the edge where you are going to paint with your first color. In our case, this was white. We brushed along the seam of the tape to seal the tape to the wall. This is a MUST-DO step! 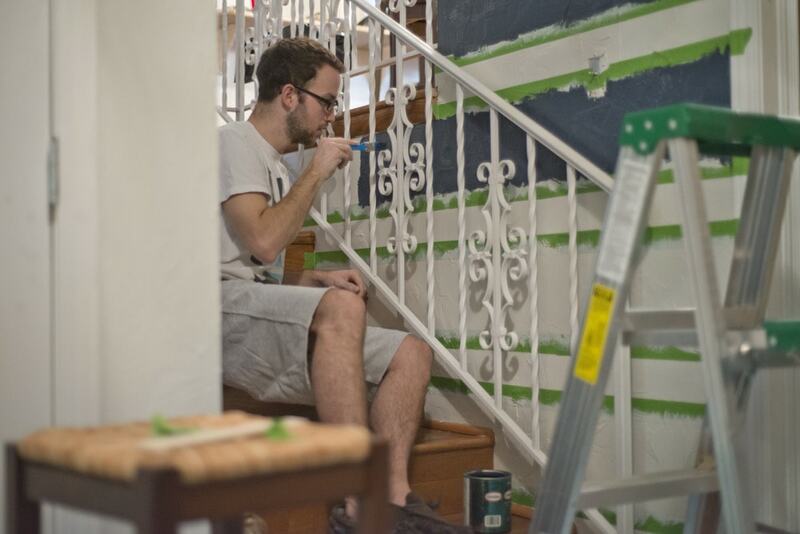 This seals the paint to the wall and allows you to have crisp lines on your painted stripes. We used a brush to brush the navy on between the lines. This worked well for us but you could probably use a small roller as well. Overall, I think there were three spots that had to be cleaned up just a bit in the end! Not bad at all, in my opinion. So, what do you think? Would you paint stripes on a textured wall?